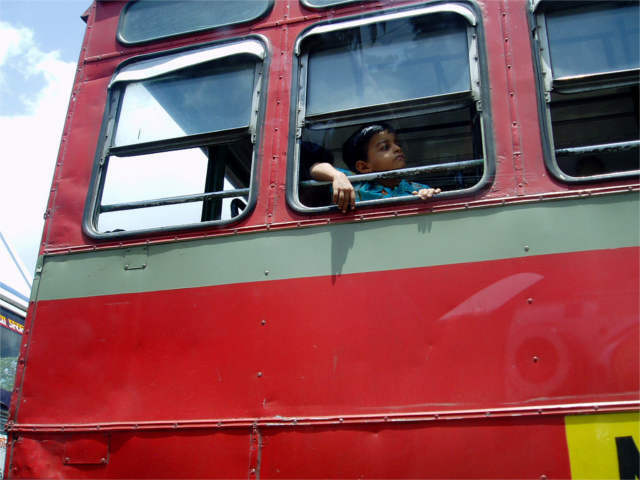 A boy peers out a bus window in Mumbai, India. Photo by gregor_y. More and more cities worldwide are grappling with the ever-increasing menace of air pollution — especially in India, which contains some of the most polluted cities in the world. Rapid economic growth in developing countries and increased individual wealth is leading to an ever-increasing number of cars and motorcycles on the roads. We are seeing highly increased emissions and rapid deterioration in urban air quality. The transport sector itself is now the fastest growing source of greenhouse gas emissions worldwide, accounting for 13% of total greenhouse gas emissions and 23% of global energy-related emissions. Most Indian cities are exceeding the critical levels of particle pollution (particulate matter, or PM) and nitrous oxide (NOx), two of the worst air pollutants. This phenomenon is due to an ever-increasing number of private vehicles, old technology, and unclean fuels. What are PM and NOx? Particulate Matter: Particulate matter is a mixture of small particles and droplets including acids, like sulphates and nitrates, organic chemicals, metals, soil, or dust. Combustion can produce a large quantity of very fine particles, known as PM10 (defined as 10 nanometers in diameter or smaller). The human body cannot protect against exposure to these PM10s and against ultra-fine particles (PM2.5) which can enter the heart and lungs through inhalation and have serious health effects, including respiratory disease and heart and lung conditions. Nitrous Oxides: They are an important family of air-polluting chemical compounds. These highly reactive gases affect health and lead to increase in global warming. Nitrous oxide can be oxidized in the atmosphere into nitrogen dioxide, which is a dangerous air pollutant in itself and can also react to form ozone and acid rain. How can our cities deal with this menace? As far as vehicle pollution is concerned, the remedy lies in adopting a multi-pronged approach with concrete steps towards promoting public transport solutions, such as bus fleets which run on cleaner fuel, such as low-sulfur diesel or natural gas. Cities should base their selection of fuel on the total cost and emissions — from extraction or production, to processing to combustion — associated with each type of fuel. Fuel policies should be revisited by municipalities, and current gaps in pricing should be taken into consideration. In India, for example, there exists a huge gap in the prices of diesel and gasoline due to fuel subsidies on diesel, which are leading to increased sales, and production of diesel vehicles. Diesel vehicles now account for 40% of vehicles on Indian roads, and the figures are expected to grow further. Most of these vehicles are operating on dirty diesel, with a high sulfur content. Yet, technology today is capable of producing diesel fuel with as low as 50 ppm sulfur content, but this cleaner fuel has thus far not caught on. A more promising and holistic solution lies in the adoption of the avoid-shift-improve framework, which essentially entails avoiding motorized trips, by planning land use and mixity in buildings in such a way that most of the trips are within short distances which can be covered by bike or on foot; shifting from individual motorized transport to public transport; and improving upon today’s fuel options and technologies. At the same time, financial incentives, and disincentives, need to be put in place to encourage use of buses and clean fuels; at the same time governments should also aim at discouraging the use of personal vehicles through disincentives, such as levying congestion charges, raising parking fees, hiking insurance premiums, etc. Research in the alternate/renewable fuels should be undertaken and efforts focused on making technology more cost effective to enable wider commercial application. The disposal of old, high-polluting vehicles also warrants more attention. The enforcement of emissions standards and disposal regulations should be strictly imposed. Moreover, emissions standards should be made uniformly applicable to an entire country across all modes of transport. Current fuel policy in India allows for a relaxation of emissions standards for 2-wheeled vehicles, such as motorbikes, which have become the major urban pollutants, due to sheer numbers and outdated technology. Air pollution needs to be dealt with in a more holistic manner, wherein major contributors, like industries, power plants, and vehicles are addressed together. A host of policies, regulations, and incentives, implemented simultaneously, are required to deal with this issue, as no one policy is sufficient to deal with this multi-faceted problem.